Atletico Madrid's on-loan goalkeeper Thibaut Courtois can play against parent club Chelsea in the Champions League semi-finals, Uefa has said. Under the terms of the loan, Atletico would have to pay a fee to allow the Belgium international to face Chelsea. But European football's governing body said in a statement that any such agreement would be "null, void and unenforceable". "The integrity of sporting competition is a fundamental principle," it added. Atletico president Enrique Cerezo had said the club could not afford to pay the fee Chelsea wanted for the two games, reportedly around £5m. That appeared to throw Courtois's chances of a semi-final appearance into doubt, until Uefa intervened on Friday. However, Chelsea chief executive Ron Gourlay said the goalkeeper's eligibility to face his parent club "was never in doubt". He added: "Regarding the Uefa statement, we'll evaluate it over the next 24 to 48 hours. As far as we're concerned we complied with loan rules. He can play against Chelsea - if selected." Atletico play Chelsea on 22/23 April and 29/30 April, with Real Madrid set to face Bayern Munich in the other semi-final on the same dates. The statement also pointed out that Uefa Disciplinary Regulations strictly forbid a club to "exert, or attempt to exert, any influence whatsoever over the players that another club may (or may not) field in a match". The governing body added that any private contract between clubs which might influence player selection is "null, void and unenforceable" and that sanctions would be made against any club violating these regulations. Courtois, 21, signed a five-year contract with Chelsea in 2011 when he moved from Genk for an undisclosed fee, but has never played for the 2012 Champions League winners. 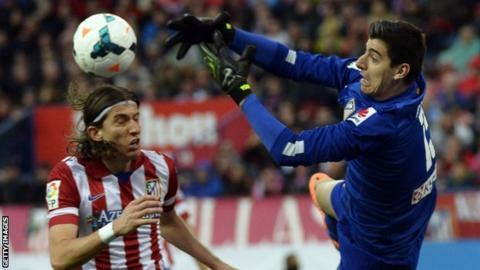 He is spending a third season on loan at Atletico, who are one point clear at the top of La Liga with six matches left.